A fire has broken out at the iconic Notre Dame Cathedral today, and as you’d expect, many news networks are offering live coverage of the breaking situation. What’s a little more unusual is that YouTube seemed to temporarily mix up the unfortunate burning of a historic cathedral with the 9/11 New York City terror attacks. Underneath live streams from CBS and others, viewers saw an explainer for the September 11th, 2001 attacks. These two things are completely unrelated, and there has been no indication that the Notre Dame fire is a result of terrorism or even criminal arson. 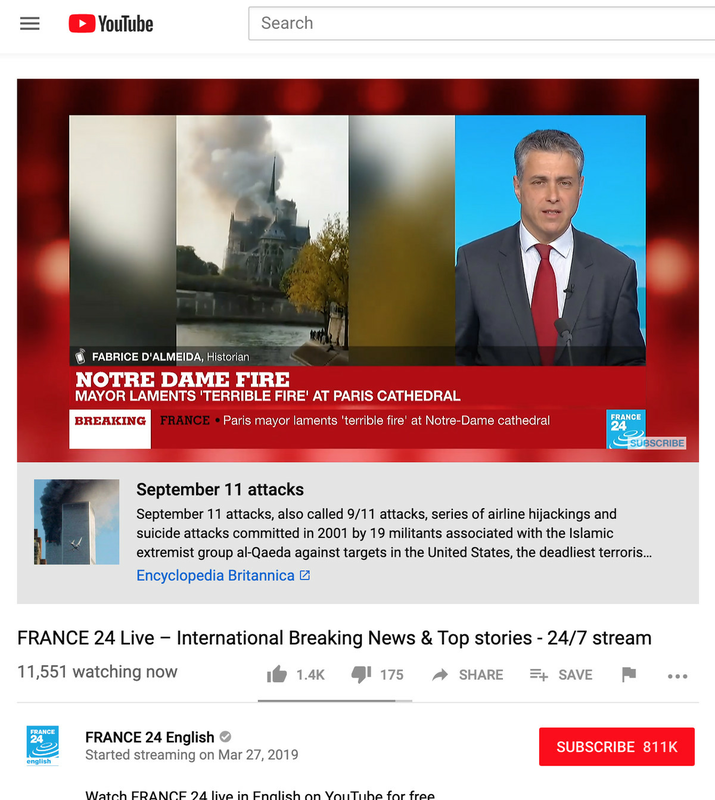 The 9/11 context was briefly visible below live streams from CBS News NBC News, and France 24 on Monday afternoon before being removed. Coverage of the fire from ABC News, Fox News, and others did not display it. The small paragraph of history regarding 9/11 is part of YouTube’s fact-checking effort to prevent the spread of misinformation and conspiracy theories on the platform. These information cues show details from Wikipedia and other sources like Encyclopedia Britannica for events that might stir conspiracies. But it’s odd that the company’s algorithm would link today’s fire to September 11th. Perhaps the visuals of smoke billowing out of a building were enough for a match, or a hashtag / something in the video description caused the connection. The Verge has reached out to YouTube for clarification. 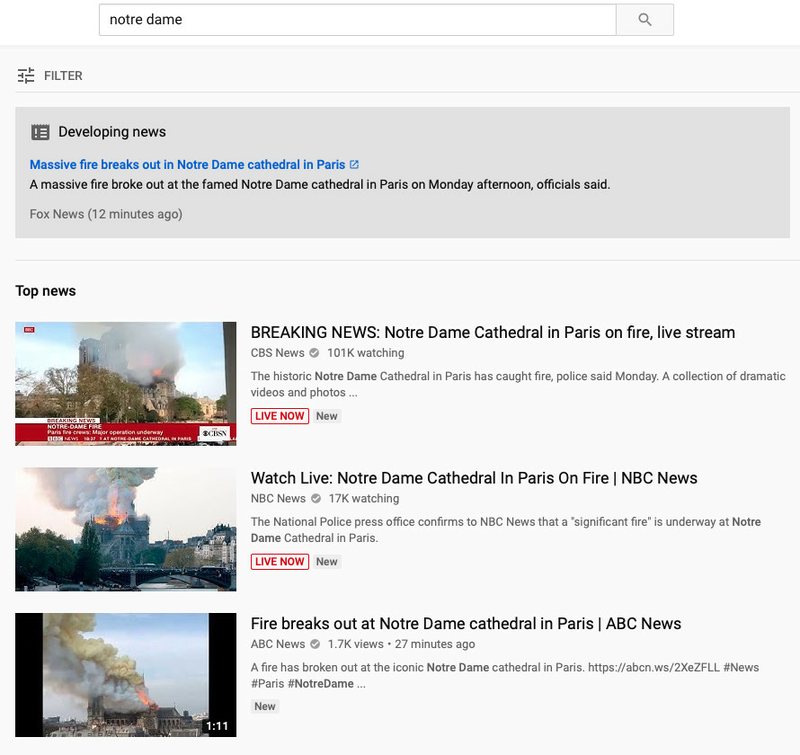 YouTube correctly and quickly identified the Notre Dame fire as a breaking news event, surfacing trusted news outlets near the top of search results. So that part of the algorithm worked as intended.